189 total yards of offense and the Ravens somehow beat the 6-3 Cincinnati Bengals 20-17. This game was painful to watch from an offensive standpoint. Neither team could get it going. Defensively, this was an impressive showing from both teams. 533 total yards of offensive, 6 turnovers, and 10 sacks combined. Other than a few miscues, the Ravens defense was dominant. The Ravens offense is in serious trouble. The running game is pathetic and Joe Flacco continues to struggle. With the O-line in shambles, the Ravens need a new strategy. They need to go with the Running Back who is more successful. Bernard Pierce was churning out 3-4 yard gains on his 8 carries, yet in the 4th quarter, Ray Rice(18 car, 30 yards) was getting a majority of the snaps. If Ray Rice isn’t getting 3-4 yards a pop, they need to sub Pierce in. If Pierce cools down, they need to go back to Rice. Every game it seems like one of the backs can barely get across the line of scrimmage while the other averages 3 to 4 yards a pop. Jim Caldwell needs to use more of a 1A 1B back system instead of Rice being the clear starter. Defensively, the front 7 pressured Dalton all game. This led to 3 costly interception. James Ihedigbo capitalized off 2 pressured throws that he returned for 46 yards. The secondary played very well. Ladarius Webb, who had been picked on the previous few games, played the best game of his Ravens career. His interception was a great jump on a curl route by Marvin Jones. He was playing at 100% speed for the first time all season. 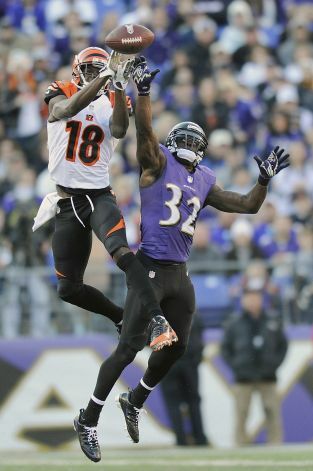 Other than the Hail Mary, Webb really kept AJ Green in check. Elam and Ihedigbo finally played a full 4 quarters. The Bengals were able to move the ball on the ground, but the Linebackers and D-line were able to maintain with a 17 point lead. Terrelle Suggs and Elvis Dumervile were absolute beasts all game. The hail mary play could have ruined the Ravens season. Ihedigbo was too tight on the pile and that quick deflection really took an unlucky hop off his hand. His reaction was what any safety would have done, so pointing a finger at Ihedigbo is wrong. In overtime, Marvin Lewis should have never allowed the Bengals to go for it on 4th down. A punt there could have easily pined the Ravens inside the 10 yard line. The Ravens offense had been terrible all night, and after a 3 and out, the Bengals could have moved the sticks 2 or 3 times and kicked a field goal to win the game. Terrible coaching by the Bengals. Bad news of the game: Haloti Ngata sprained his knee. This could be a huge loss in the run game. Hopefully he is good to go next week vs Matt Forte and the Bears offense. This entry was tagged AJ Green, Andy Dalton, Baltimore Ravens, Bernard Pierce, Cincinnati Bengals, Elvis Dumervile, Haloti Ngata, James Ihedigbo, Ladarius Webb, Matt Elam, Ravens Bengals Reaction, Ravens vs. Bengals, Ray Rice, Terrelle Joe Flacco. Bookmark the permalink. ← Report: Ed Reed to be Released by the Texans. Come on home!